Realtime classroom collaboration and demonstration for software developers. Do you teach software development? Do you use lots of code in your classroom? 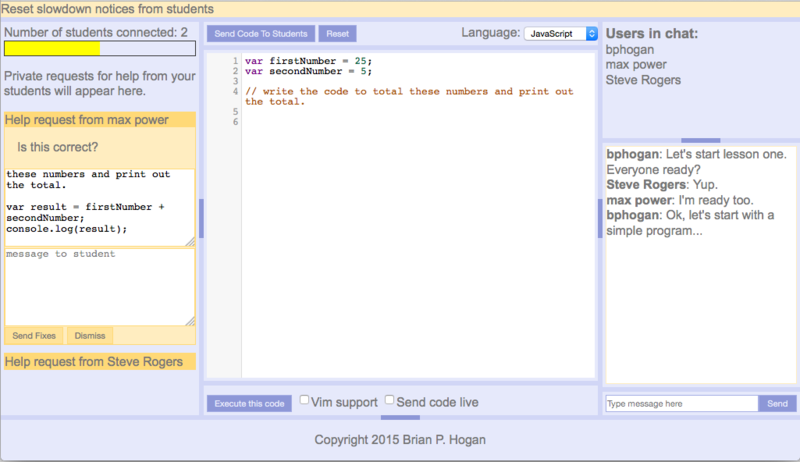 Codecaster lets you push your demo code right to your student's machines, either in realtime or all at once. You can send the full code, or provide starter code and let students finish it. Students can ask for help by sending their code to you for review, or ask you for the nudge they need to get to the answer. With Codecaster, students stay excited, connected, and engaged. Join your teacher's classroom. Use the room name they provide. This application allows you and your teacher to communicate privately. Nobody else but you and the teacher will see your private messages. The teacher will be able to periodically view your progress. Get your own private meeting room with a code editor, chat, and message center. Guide students through exercises or offer one-on-one help in either face-to-face or online sessions. Push code examples right to student's screens. See who needs help, even the quiet students. Automatically catch up students who fall behind or join late. 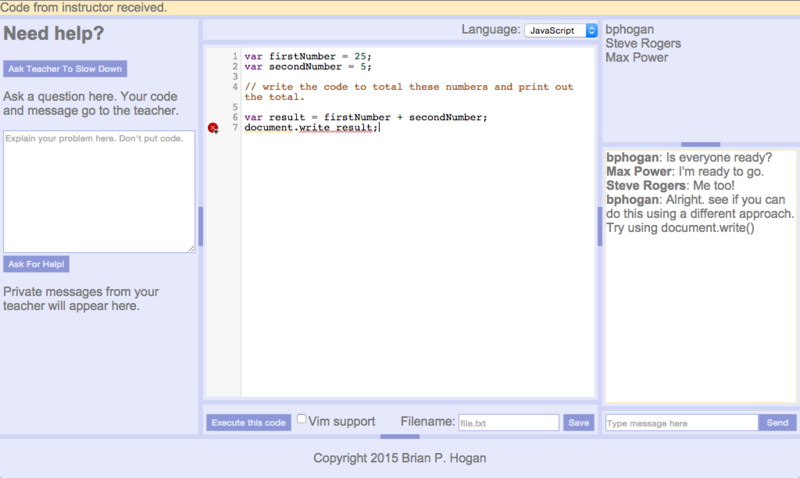 Provide starter code for in-class exercises easily. See if students are falling behind. As a student, you'll join your instructor's virtual classroom and work on provided activities. You'll be able to privately send help requests to your teacher and save the code you work on to your own computer. Participate actively in classroom coding exercises. Receive private help from the teacher when you feel stuck. Let the teacher know how things are going privately. Tell the teacher to slow down!